Shirley Ellis took these shots in her back yard in Old Town. 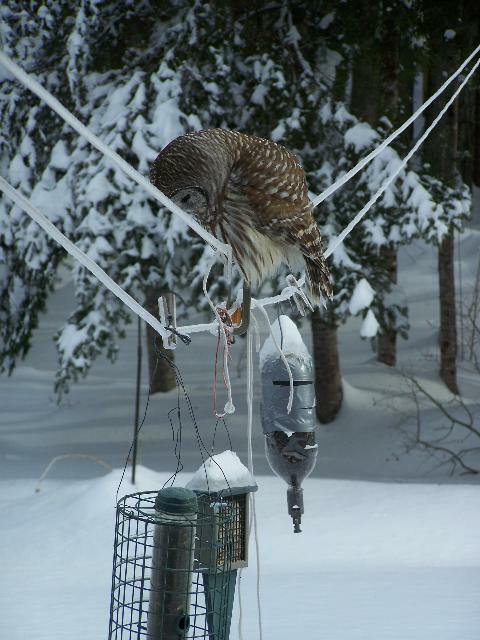 The owl was patiently waiting for a squirrel that had tunneled through the snow to the bird feeder. The ice was so thick during this time that large birds were having a hard time breaking through to capture their prey. These large (17-24 " tall with a 38-48 " wingspan) owls are often active before dark. 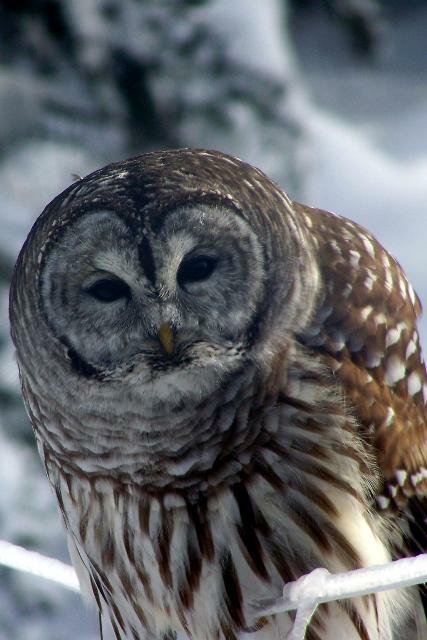 Note the brown eyes (other owls found in the northeast have yellow eyes) and the barred pattern across the chest and vertically to the belly area.Their voice is distinctive, with a pattern similar to "who cooks, who cooks, who cooks for you all". They are found in dense woodlands and increasingly in suburban neighborhoods.